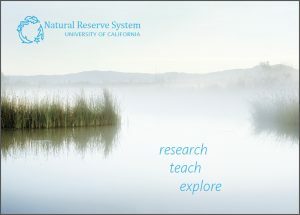 Use these resources to increase awareness about your reserve and the NRS among students, faculty, and the general public. We've printed up brochures and postcards, created downloadable maps and flyers, and produced large banners you can borrow to draw attention to your booth or event. 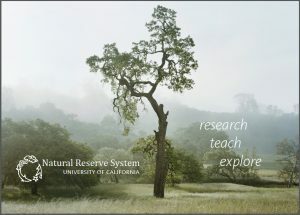 This trifold brochure provides an overview of the NRS. You can also use the pdf to produce copies of your own. The Systemwide Office can ship you copies; please contact Donna with your request. 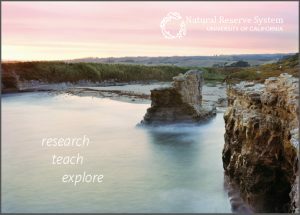 Meant to be tucked inside the NRS brochure, these inserts provide a brief description of each program and a menu of giving options. Each is the size of one brochure column and is printed on both sides.The Systemwide Office can ship you copies; please contact Donna with your request. Retractable banners are 33.5 inches wide by 84 inches tall. There are four designs. Please contact Donna if you would like to borrow one or more. After downloading pdfs for these five designs, you can have them printed at a local copy shop. 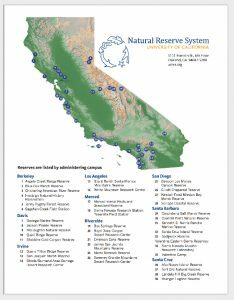 The map flyer shows reserves listed by administering campus. 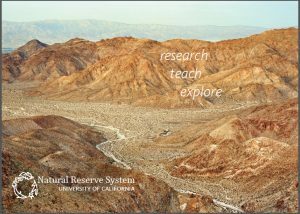 For higher resolution versions of the NRS map, maps with reserves numbered north to south, or maps with reserve names next to location dots, contact Kathleen. 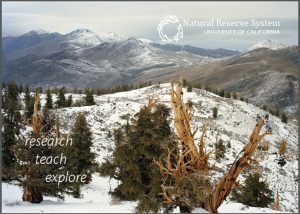 The Fact Sheet offers information about the NRS by the numbers, including acreage, grant funding, user statistics, publications, etc. 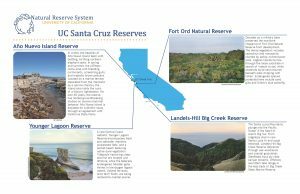 These handouts describe the NRS reserves administered by each campus. There are nine designs, one for each campus. Download the pdfs from this page. 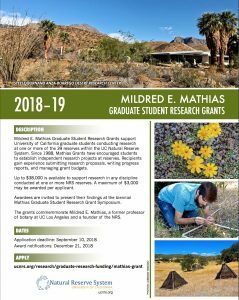 The most recent flyer encouraging UC graduate students to apply for the NRS's Mildred E. Mathias Graduate Student Research Grant program can be found on this page. 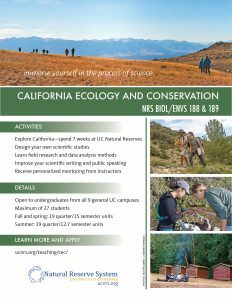 There are five different designs for these flyers, which encourage students to apply for the NRS's California Ecology and Conservation course. Download the pdfs from this page. These collections of the spin cycle and the spin cycle plus text have been zipped for easy download. If you don't see what you need, contact Kathleen. These NRS maps are saved as png files with transparent backgrounds. 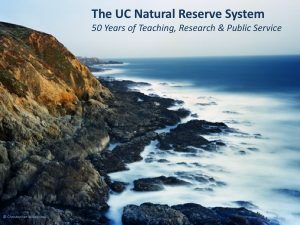 If you require versions that are larger, have numbered dots, come with UC campus label dots, or other variations, contact Kathleen. Feel free to borrow from or edit this slide deck by Peggy Fiedler. Flora, pelts, bones, mounted specimens, fossils, and rocks arrayed at an interactive "touch table"